Two years of BRANZ independent testing proves Resco’s MultiCom wall panelling system is the smart solution for wet, damp or graffiti-prone high use areas requiring superior levels of hygiene. MultiCom is a cost effective, rugged, one panel walling system; panels are blind fixed with no need for a conventional impact resistant backing sheet. MultiCom solid core Compact Laminate wall panels are 6mm thick. The large panel sheet size of 2450mm x 1850mm minimises the number of jointers. However sheets can be cut down to suit needs, providing flexibility and ensuring cost-effectiveness. Custom aluminium jointers that incorporate built in expansion slots can be powder coated to match the panel. 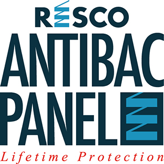 All Resco panels are extremely low maintenance, water, impact and graffiti resistant, and contain Antibac, an innovative new bacteria-repelling compound. Our panels come in New Zealand’s largest choice of colours and are backed by lengthy guarantees.